First and foremost: most del.icio.us users I know have all experienced the horrific "Oh-my-God-why-didn't-they-warn-me-about-that-I-hate-the-universe-now" moment. This section hopes to keep you from sharing this traumatic experience. You'll notice that the entry form for a bookmark includes a "notes" field. Although the page doesn't say so, and even misleads you by creating a resizable text box, the "notes" field caps out at 255 characters. 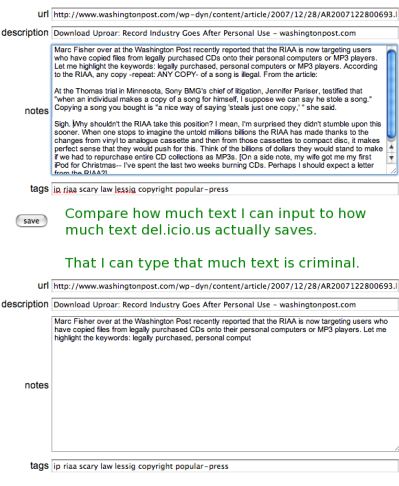 The illustration on the right demonstrates how much you can type (top) and how much del.icio.us actually saves (bottom). So, before you write that brilliant (of course) reflection on whatever you've just discovered which will eventually make it into that conference paper / article / dissertation / book you're working on, open up a word processor. Because del.icio.us will eat your homework. The second frustration you might experience with del.icio.us is nowhere near as traumatic. While del.icio.us does have a global search function (global in the sense that it allows you to search through everyone's tags), surprisingly there is no way to rank the responses. One would think that the responses would automatically weigh according to the amount of times they had been saved by other users, but this is not the case. Instead, responses are ranked according to recent activity (I can't find any official definition of "recent"). This can become a problem with popular tags like "new-media" (which has 17,922 bookmarks). The tag "new-media" presents us with another kind of problem: some users choose to tag it as "newmedia." Since del.icio.us does not allow for spaces between tags, you should be creative when looking for two-word subjects. For instance, if I search for "newmedia," then I find an additional 24,181 bookmarks-many of which, of course, are repeats of "new-media." This second page will display recently popular bookmarks. Again, there is unfortunately no way to get pure weight rankings for a tag. And while you might find a plethora of third-party search softwares and extensions, I couldn't find any that organized all user tags (most extensions offer ways to organize your tags). Del.icio.us does offer some hints far advanced searching, particularly several useful Boolean-style operators. To sum up, del.icio.us is more designed for aimless exploration than for pointed investigation. It is a good way to stay current and, like Google or the bibliographic sections of Wikipedia , a good place to start a research project.